In Nikola Tesla and the End of the World Season One, Dr. Sophie Clarke was a teaching fellow in physics at a London university when Nikola Tesla turned up. The enigmatic turn-of-the-century inventor who, among other things, helped develop the alternating current power system used all over the world is back. Together they were... not on the same page. But they overcame their differences to save the world from an army of psychotic historical robots. In Season Two Nikola Tesla discovers his ability to time travel is by tapping into the multiverse. Unfortunately he has inadvertently built up a huge debt to the agency that manages inter-dimensional travel. Working with new friends to pay off the bill, it is soon apparent that the agency has another agenda - and it's not friendly. 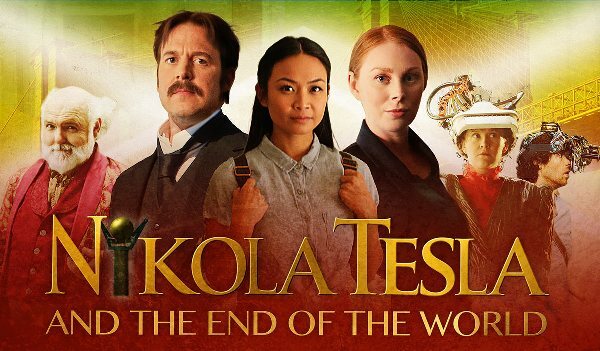 Nikola Tesla and the End of the World Season 2 is supported by the Canadian Media Fund, and the Manitoba Film and Video Production Tax Credit. "...it is a stroke of genius to transport to the present a charismatic inventor decades ahead of his contemporaries and pair him up with a down-to-earth physics lecturer." "...a web series that not only is zany fun, but also manages to slyly comment on some important contemporary social issues. While watching, I got the same vibe from the light, airy tone of the series as I did from many of the best episodes of Doctor Who." "Nikola Tesla y el fin del mundo una miniserie que no te puedes perder." Nikola Tesla and the End of the World is a miniseries you can't miss. "faites-vous un peu de science-fiction avec Nikola Tesla and the end of the world... voyez ci-dessous le �making of� de cette webs�rie �amazingly geek�." "get a bit of science fiction with Nikola Tesla and the end of the world... be sure to watch the "making of" this "amazingly geeky" webseries." "If you're a fan of the low-tech earlier Dr Who, you're bound to enjoy this series." "...fun and very well executed, with a charming humor that is absolutely nailed by the two leads." "El d�o de cient�ficos tiene una qu�mica genial e, insisto, lo �nico que se le puede reprochar a esta serie es que dure tan poco." The two scientists have great chemistry and the only thing wrong with this series is it's over too soon.